Playing wide receiver in a wishbone offense in college, Chandler caught 93 passes for 1994 yards (21.4 avg.) and 22 touchdowns, adding 353 rushing yards and six TDs in his senior season of 1977. He received some All-American recognition after both the 1976 and ’77 seasons and was chosen by the New Orleans Saints in the first round (third overall) of the 1978 NFL draft. Chandler caught 35 passes for 472 yards (13.5 avg.) as a rookie and broke out in 1979 with 65 receptions for 1069 yards (16.4 avg.) and six TDs, gaining selection to the Pro Bowl as well as second-team All-NFL honors from NEA. He followed up with another solid year in ’80, catching 65 passes for 975 yards (15.0 avg.) and six touchdowns. The Chargers obtained him during the 1981 season after having dealt disgruntled WR John Jefferson to Green Bay, and Chandler proved to fit perfectly in the high-powered “Air Coryell” (for Head Coach Don Coryell) passing offense. Of his 69 catches for 1142 yards and six TDs, 52 for 857 yards (16.5 avg.) and five scores came with San Diego. Chargers went 6-3 in the strike-shortened season and were fifth seed in the AFC playoff tournament that replaced the usual postseason format while leading the NFL in total yards (4048), passing yards (2927), touchdowns (34), and scoring (288 points). Won First Round playoff over Pittsburgh Steelers (31-28). Lost Second Round playoff to Miami Dolphins (34-13). Although hampered by a sprained foot, Chandler caught 58 passes for 845 yards (14.6 avg.) and five touchdowns in 1983 and was again selected for the Pro Bowl. He slipped further in ’84 but bounced back with 67 catches for a career-high 1199 yards (17.9 avg.) and 10 TDs in 1985, earning another Pro Bowl trip. 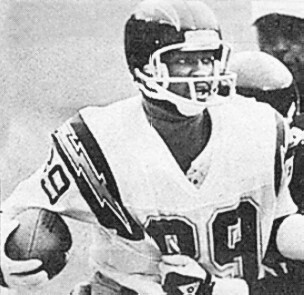 Following lesser seasons in 1986 and ’87, and with the team in decline, Chandler was traded to San Francisco in 1988 where he caught four passes in four games in his last year. Overall, Chandler caught 559 passes for 8966 yards (16.0 avg.) and 56 touchdowns, with 373 of those receptions for 6132 yards (16.4 avg.) and 41 TDs coming with the Chargers. He was a consensus first-team All-NFL selection once, received second-team honors after one other season, and was chosen to four Pro Bowls.